I have this group called The Darlington Society. It’s an inner group of readers that I have a kind of special relationship with. I don’t want to take up a lot of space here but you can read all about the Society on its own page, the benefits, the responsibilities, the theory behind it. I used to accept only a limited number of readers per book release but am now opening the doors for anyone to join. Here’s a little blurb straight from the page . . . If you wish to join The Darlington Society I ask you to do only two things. 1) Pray about it. I take the Society seriously and hope you will too. This is a reflection of how seriously I take my writing and my desire is to be partnered with others who also take it seriously. 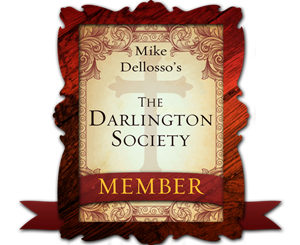 2) Email me at michael_dellosso(at)yahoo.com and tell me you want to be part of the Darlington Society. It’s really that easy. I’ll add you to the mailing list, invite you to the Facebook group, and email you the “badge” to put on your own blog or website. Are you in? Just drop me an email saying you’d like to join. FEARLESS releases in May and I’d love for you to be a part of the event. Oh, and I’ll ask one more thing . . . please share this with your friends and fellow readers and writers and basically anyone with a heartbeat. Thank you! The Darlington Society (A Thousand Sleepless Nights) Announced! Before I announce the group, I want to thank everyone who put their name in the hat for The Darlington Society. I love this little group and truly believe God has his hand on it. Narrowing it down is a tough job and not one I take lightly. There are always a few names I agonize over (not in a bad way). Congratulations to the active members this time around. I’m sure we’ll have a fruitful time interacting for the next five months and I’m looking forward to working with each of you. I think we have a great team. Again, congrats to all the new members. I hope you find the time you spend in this little group worth your while. I’ll be sending out a welcome email to all of you sometime next week and the new group will officially begin July 1. Stay tuned . . .
That’s true even of writers. I need help and support, wisdom, suggestions. I need prayer and encouragement and, occasionally, rebuking. I fully realize that if I’m going to succeed at this writing thing I’m not going to do it alone. The road is too rough and sometimes the walking too lonely. That’s why I started The Darlington Society. 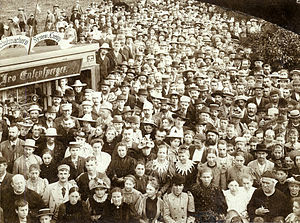 The Society is a group of volunteers who agree to support me in my writing in a variety of ways. Those ways include promoting via social networks, book reviews, word-of-mouth marketing, but also encouragement and prayer and yes, even correction. I need that too. In return, the members of the Society receive an advanced reader’s copy of my next novel (A Thousand Sleepless Nights under my pen name Michael King), special deals on my books, first dibs on upcoming news and events, and an insider’s look at the whole writing and publishing process. Will you please consider joining the Society? I’m only taking 30 members this time around and TODAY IS THE LAST DAY TO THROW YOUR HAT IN THE MIX. Just leave a comment on this post or this one and you’ll be entered. The Society members will be announced on Friday. For all the information about the Society, go to the official Darlington Society page and read over it. I look forward to getting to know some of you better! Last year I came up with the idea for The Darlington Society. I was feeling a bit overwhelmed with my writing and life in general and decided I needed some support group. 25 charter members were chosen and we spent nine months interacting, encouraging each other, praying, and supporting. They were my A-team and, looking back, so much happened that wouldn’t have if I didn’t have them in my corner. I was blessed and I hope they were too. Overall, I think it was a great success. So I’d like to do it again. This time we’re looking for 30 members. One, read over the details of the Society again and please make sure this is something you want to commit to for five months. I’m excited about getting to know some of my readers better and working with them to reach more people with my books. If you’re a member, I’m betting you’ll count it a positive experience. We’ll be a blessing to each other. Two, today, June 18, through Wednesday, June 20, post a comment on this blog or my other blog telling me in a few sentences why you want to be a part of the Society. I’ll read over those posts, pray about them, and announce the 30 new members on Friday, June 22. **Now, a disclaimer is necessary. I have readers overseas who I know will want to be a part of this. That’s okay. We’re not going to exclude anyone just because they live in a different country. That would hardly be fair. BUT, please understand we can’t send hard copies of ARCs/manuscripts overseas, the postage is just too much. If you live outside the US you will recieve the early reader’s copy of my next book via email as an electronic edition. Lastly, please help spread the word about this unique opportunity by sharing this post on Facebook and Twitter and maybe even your own blog. I’m looking forward to reading all your comments and embarking on a new journey with you. Please note: This term of The Darlington Society is for my first book under my new pen name, Michael King. The novel is NOT suspense but drama. Titled, A Thousand Sleepless Nights. Questions? Please leave it as a comment and I’ll do my best to answer them. It’s time for an open call for another season of The Darlington Society. What is The Darlington Society? It’s my A-team, a group of readers chosen to help me in this writing journey. And in return, they receive some pretty cool benefits as well. You can read all about it on The Darlington Society page. Please take the time to read over it. Stay tuned because next Monday, 6/18, will be the kick-off of the official open call for membership. But please note, this season of members will be involved in my new drama novel, A Thousand Sleepless Nights, published under my pen name, Michael King. Check it out, pray about it, consider it, then watch for the official call! First, thank you all for your kind, heartfelt comments and interest in joining me in this writing journey. I’m flattered, honored, humbled. This was a tough decision, I won’t mince words about it. Some of you I know via the internet, a couple I know personally, but most only casually or not at all. Let me clear one thing up: I don’t like hurting feelings. Not my personality at all. I’m not a “Oh, well, they’ll get over it” kind of person. If I could I would have chosen all of you. Part of the reason I originally wanted to do the first-come, first-serve thing was so I didn’t have to choose and therefore leave some out. But after some good counsel and prayer I realized that probably wasn’t the most prudent way to go about it. So I had to choose . . . and there were only 25 slots. For those of you not chosen please believe me when I say it’s nothing personal and that I feel terrible leaving anyone out. I have an advantage in that I know what this next nine months will bring (or at least I think I know, one never really knows) and, after prayer, I tried to match the members with what’s coming just over the horizon. And with that in mind, I believe the right 25 were chosen for this specific nine-month period in my life. Time will show that. If you weren’t chosen this time I hope you’ll stick with me and my books and apply again next time around. So . . . without further ado. Here are the 25 charter members of The Darlington Society. (I’ll be contacting all of you via email in the next week or so). Congratulations! I’m very excited about this Society and where life will take us. Hang tight and be looking for an email from me in the next week or so (I need a few days to get my ducks in a row, notify my publisher, do some organizing). God bless! A couple months ago I came up with the idea for The Darlington Society. I was feeling a bit overwhelmed with my writing and life in general and decided I needed a support group. Yes, it took me almost five books to realize that . . . I can be a slow learner at times. I ran the idea past the marketing and publicity people at my publisher and they agreed and offered some valuable input. And now here we are, the day has come for the open call for charter members of The Darlington Society. If you’re interested I’ll ask you to do two things. One, read over the details of the Societyagain and please make sure this is something you want to commit to for nine months. I’m excited about getting to know some of my readers better and working with them to reach more people with my books. If you’re a member, I’m betting you’ll count it a positive experience. We’ll be a blessing to each other. Two, today only, November 1, post a comment TO THIS BLOG POST telling me in a few sentences why you want to be a part of the Society. I’ll read over those posts, pray about them, and announce the 25 charter members on Wednesday, November 2. I know in some previous announcements I said it would be the first 25 to respond but this is too important of a decision to leave it up to that. I apologize for the change in course. **Now, a disclaimer is necessary. I have readers overseas who I know will want to be a part of this. That’s okay. We’re not going to exclude anyone just because they live in a different country. That would hardly be fair. BUT, please understand we can’t send hard copies of ARCs/manuscripts overseas, the postage is just too much. If you live outside the US you will recieve the early reader’s copy of my next book via email as an electronic edition. You may however order copies of my books directly from me at the discounted prices but I’ll have to ask you to cover the postage cost. Watch for a call for charter members of The Darlington Society tomorrow, November 1. Important details will be given. You won’t want to miss this. The Darlington Society: Open Call November 1! The Darlington Society is almost here! I’m looking for 25 readers who are willing to take this writing journey with me for the next nine months. (And FYI, some exciting things will be happening). Interested? Read the details carefully and check back on Monday for one more update before the open call is given on November 1. Will you be among the charter members?